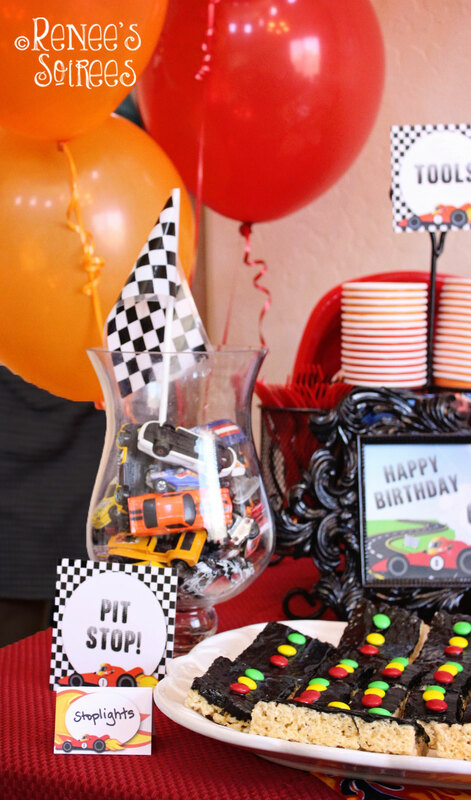 If you know someone – child or adult – who loves cars, racing, Hot Wheels, Formula One, or NASCAR, then I hope you’ll get a kick out of the RACE CAR PARTY that I threw for my son’s 8th birthday! 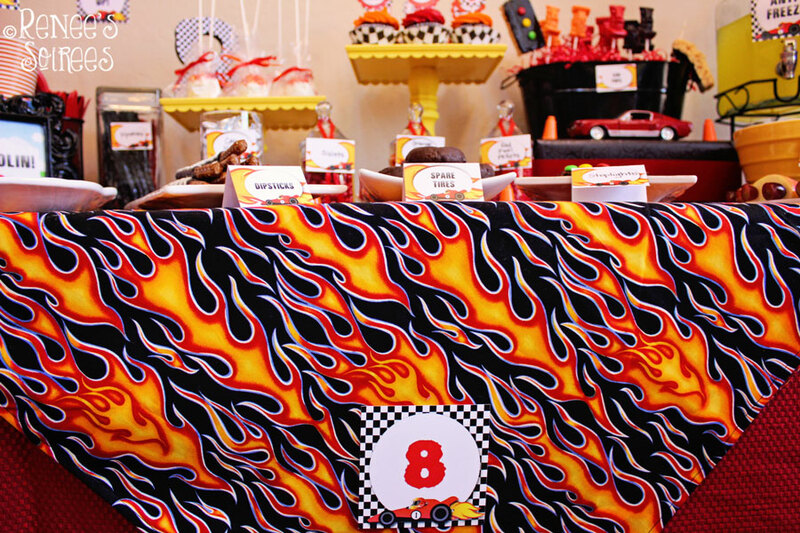 We chose this theme because my son is a long-time Hot Wheels fan. 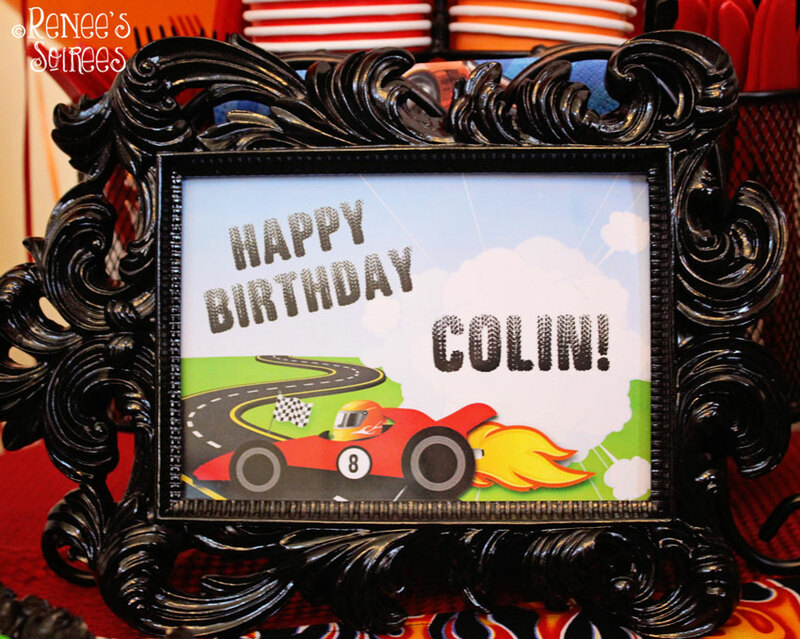 In fact, when Colin was in preschool, he wouldn’t put on a pair of pants unless it had LOTS of pockets, so he could carry tiny cars with him everywhere he went. So we stocked up on cargo pants — and toddler belts, because the weight of all those cars made his pants sag! 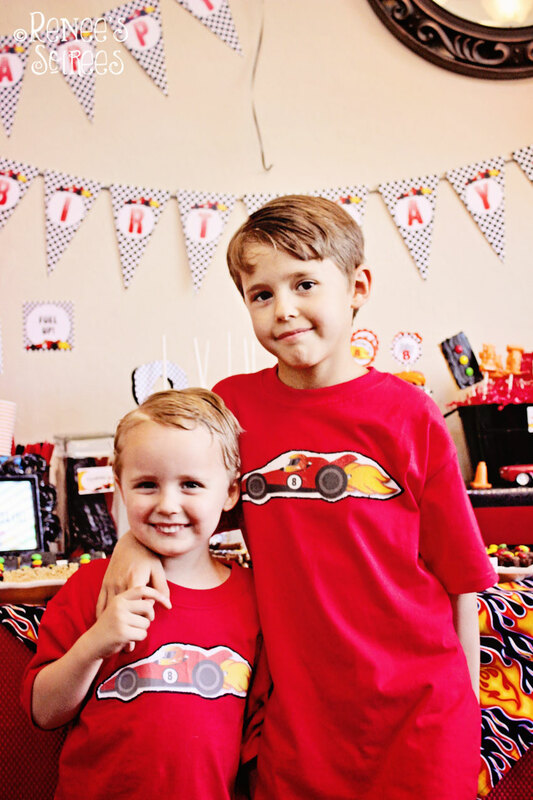 Recently I took him to a friend’s birthday party, and my son spent most of the time in the other room alone, playing with some Hot Wheels and a big track. 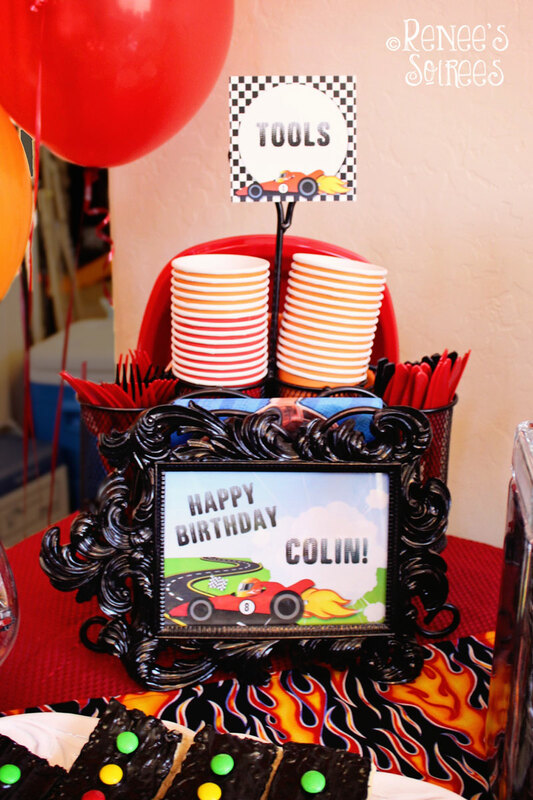 That’s when I knew that he STILL loved cars and needed to have a Race Car theme for his next birthday! I decided to use less of the ubiquitous checkered pattern, and more of the flames. 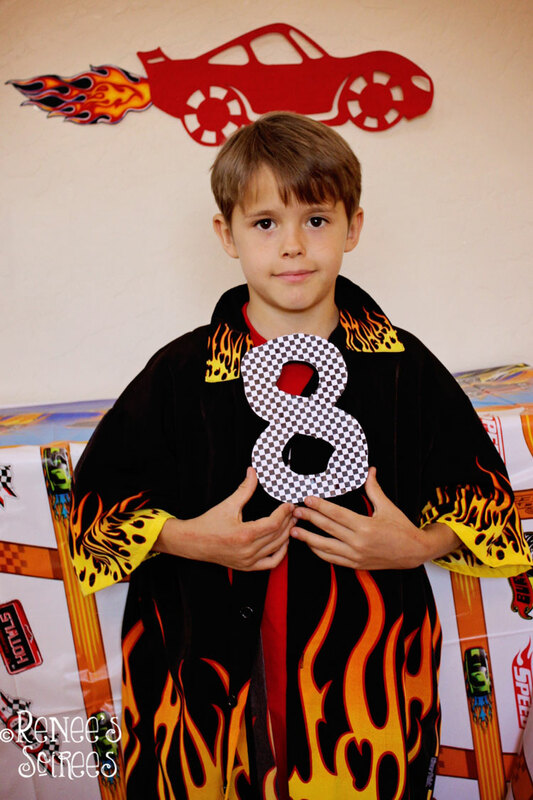 The flame theme also inspired the color scheme of red and orange. Then we asked guests to put their names on a custom hanging tag. 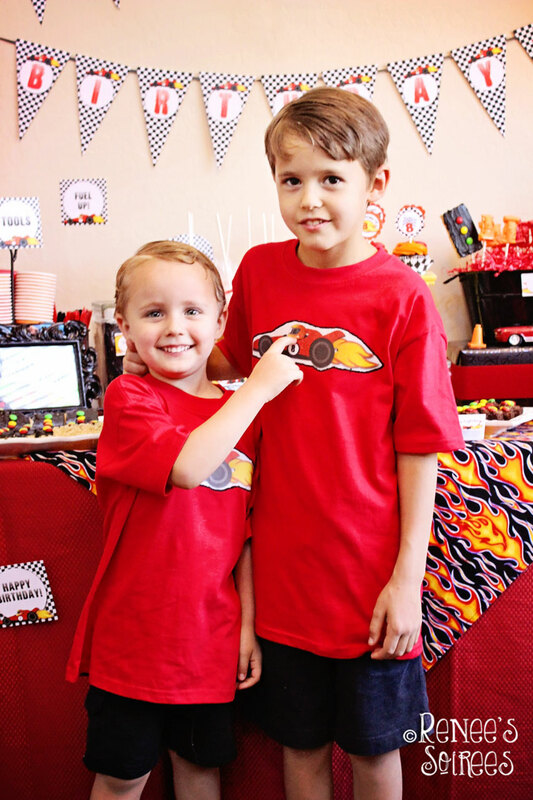 I wanted the kids to feel comfortable approaching the adults present, and I wanted to be sure I knew the names of all of my son’s classmates (invitations were given to the whole class, so I didn’t know some of them very well). 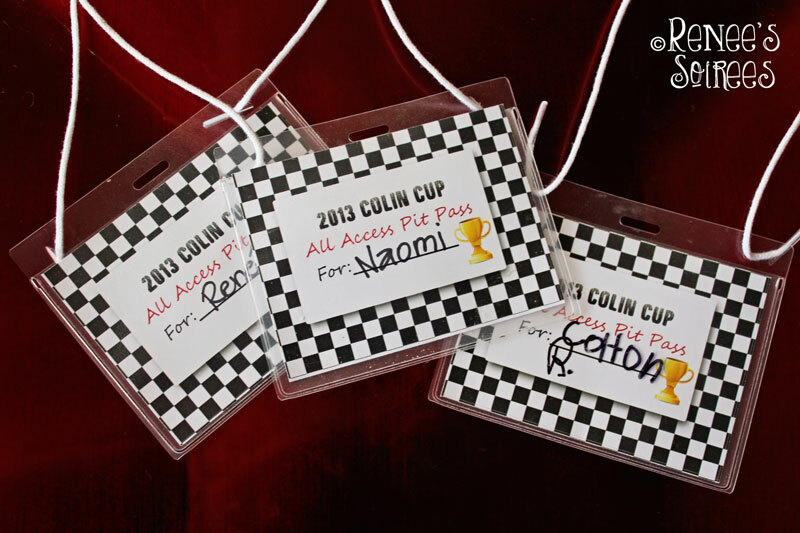 An added bonus: the kids felt very special having a personalized badge on! 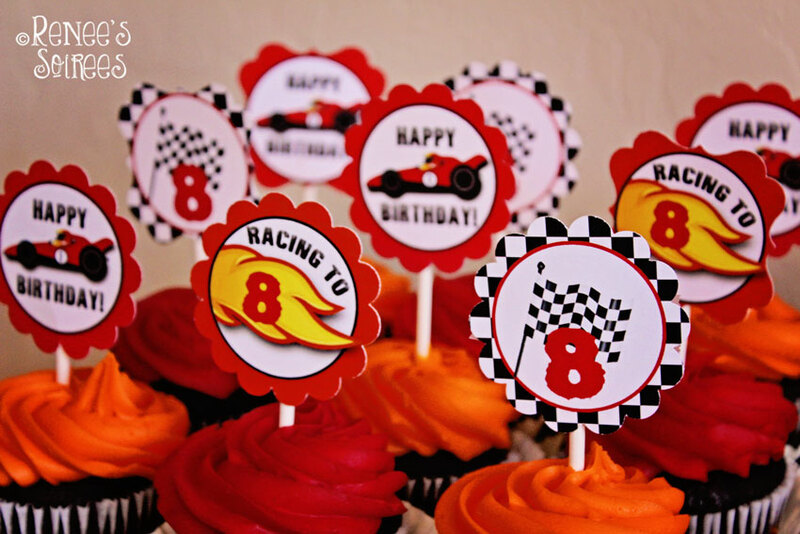 Here are the cupcake toppers. I cut most of them using a 2 1/4″ puncher, and I really like that size (versus the 2″ standard). I think the larger ones make a bigger impact. 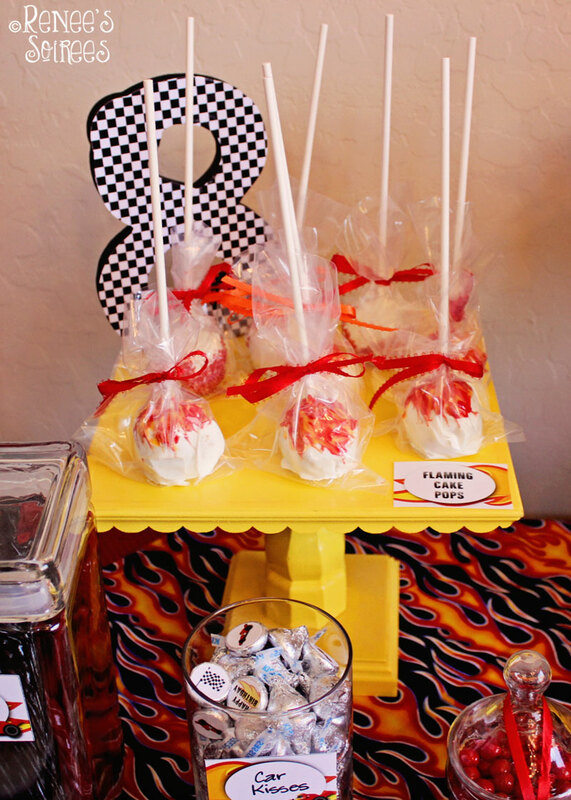 I made the chocolate race car lollipops using this mold, and a few different colors of Candy Melts. They were actually very quick and easy to make! (Tutorial coming soon!) 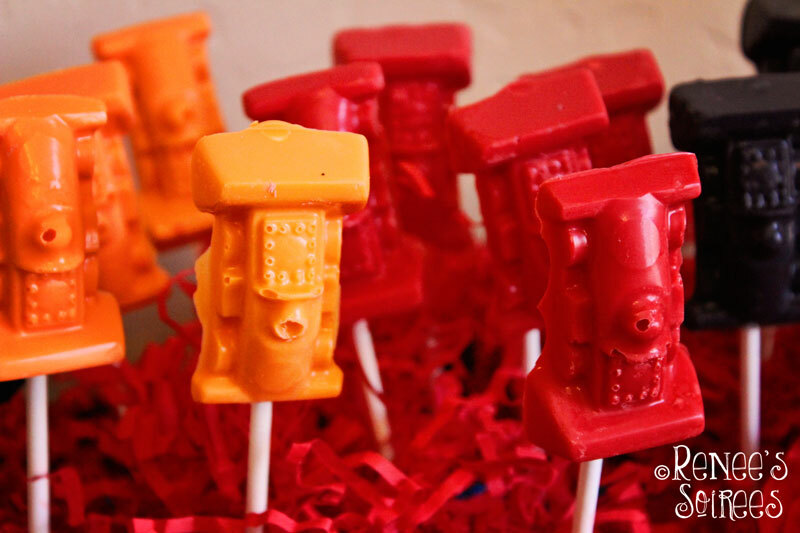 You can use the same mold to make little soaps, if you want to include those in the favor bag. 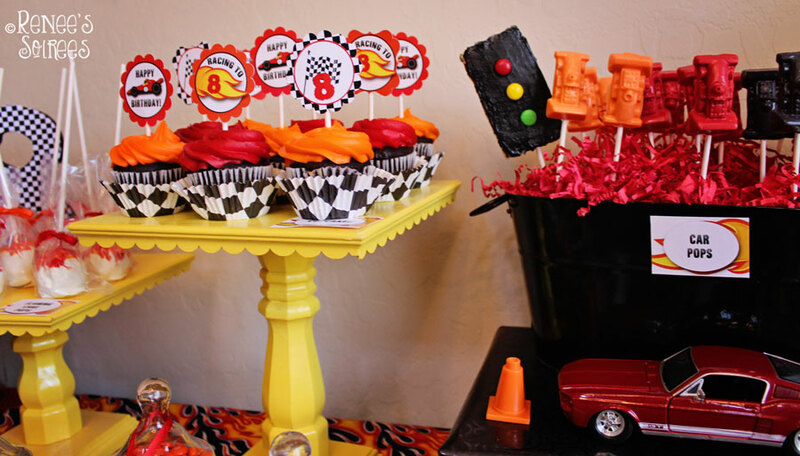 Creating car-themed foods was so much fun. 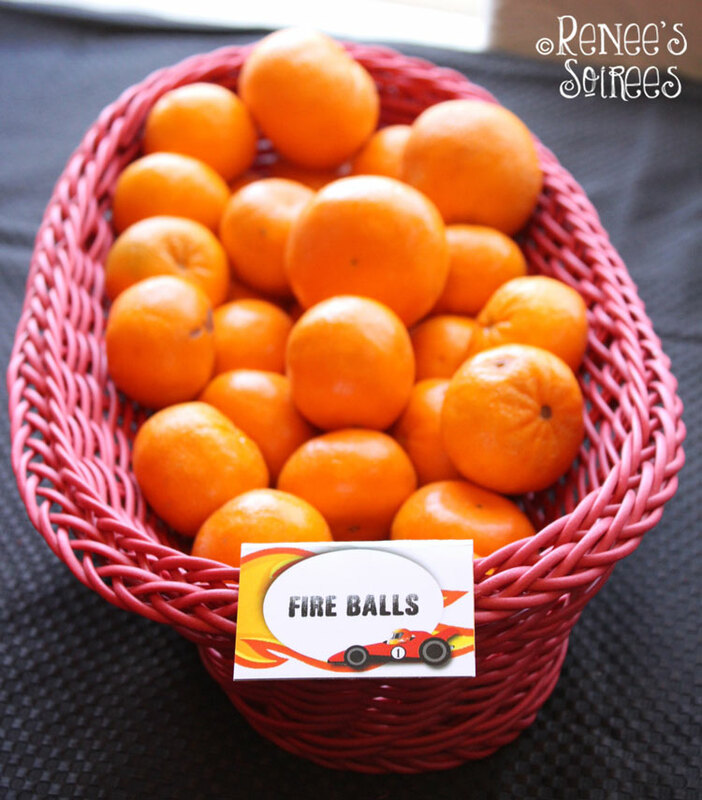 These fruit cars were easy to make, especially if you buy a bag of pre-sliced apples that are already treated with lemon juice so they won’t brown quickly. 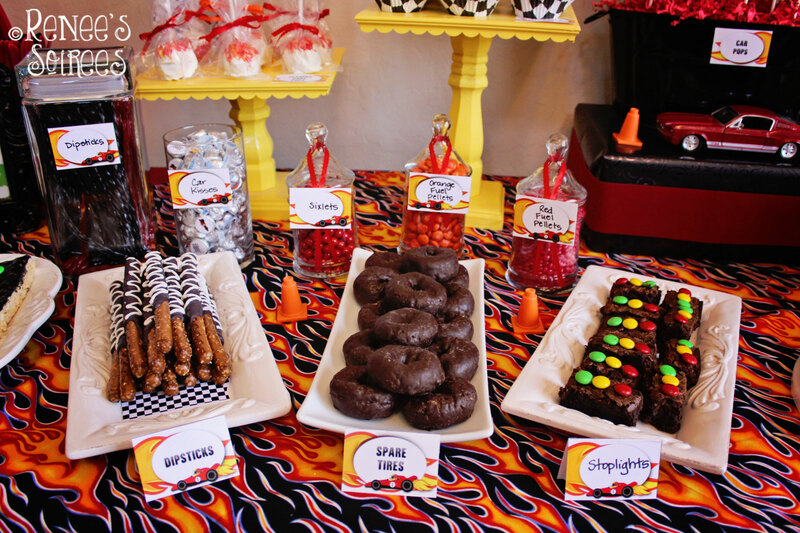 I also made some Dipsticks (pretzel rods dipped in black candy melts), Stoplights (brownies topped with M&Ms), and Spare Tires (chocolate mini donuts). 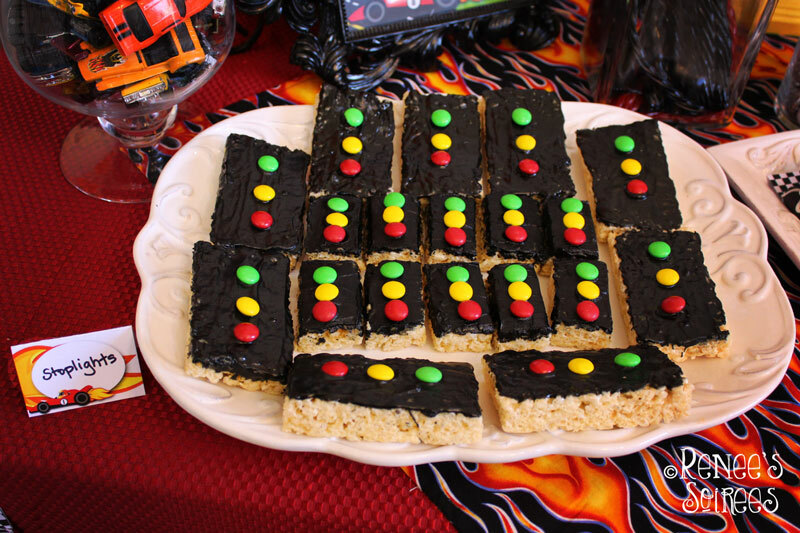 I also made another version of Stoplights, out of Rice Krispie bars dipped in black candy melts. I’m glad that my sister volunteered to make some at the last minute, because they were a HUGE hit with kids and adults alike. I was surprised that they were the food that disappeared first. The only downside to the Stoplight Rice Krispies? The resulting black tongue! (Though the chances are good that my 3 year old just licked the top of them, LOL). 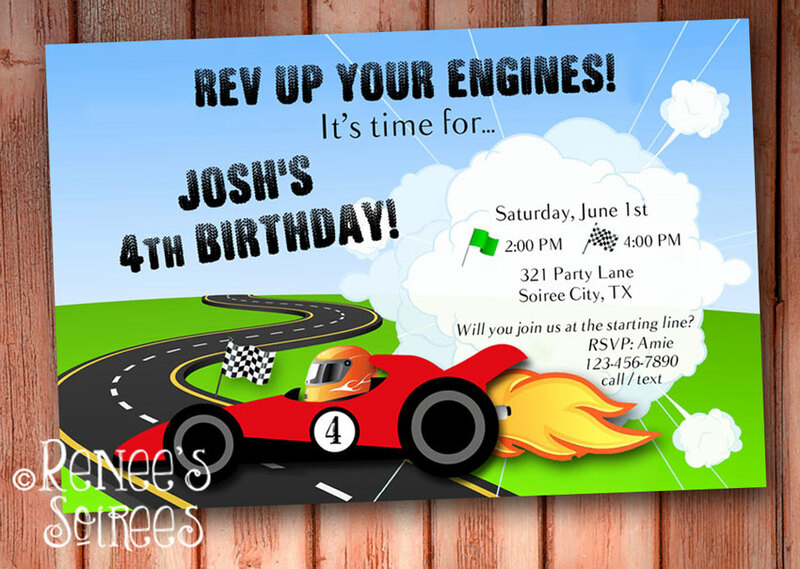 By the way, my mother made the shirts using the race car graphic from my collection, and it matches the invitation. She just printed the graphic onto iron-on fabric. She added the black stitches just to make the image ‘pop’ more… you could also just iron it on and call it a day. 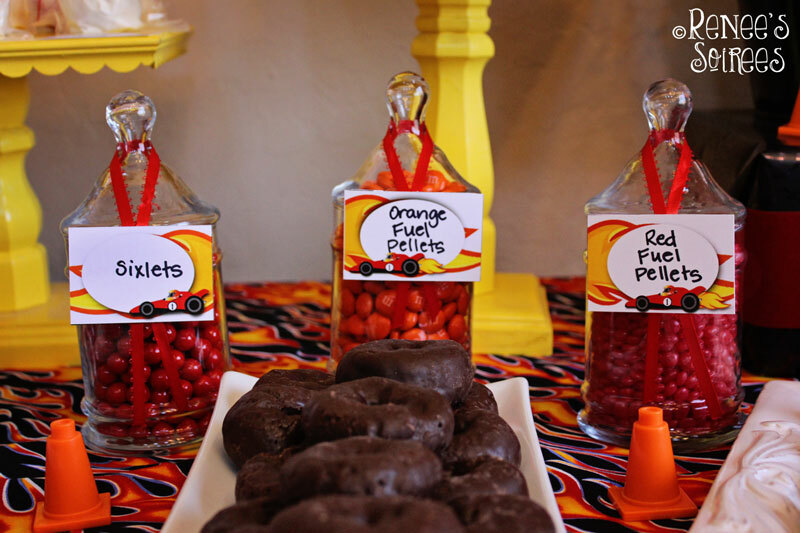 I always fill some apothecary jars with color-coordinated candies. And here’s a tip: instead of buying the expensive single-color M&Ms at party or craft stores, just buy the jumbo bag of standard colors at a warehouse store, and have your kids sort them into zip-top baggies. 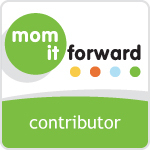 It’s good for sorting and categorizing practice, and is great fine motor skill work. I also threw in some healthy [non-tongue-staining] food, like Cuties, sub sandwiches, etc. This beverage dispenser was filled with lemon-lime Gatorade, and it went FAST. 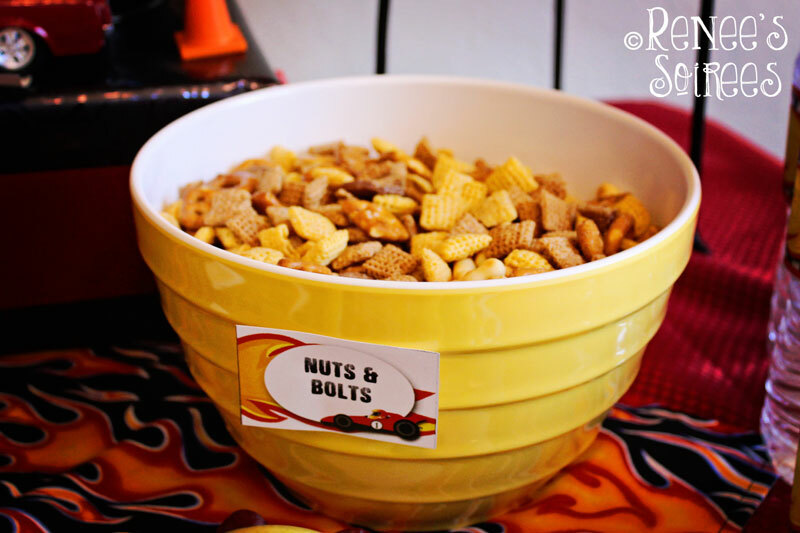 Definitely one of the most popular items with the kids. I bought a gallon, but could have easily gone through two. 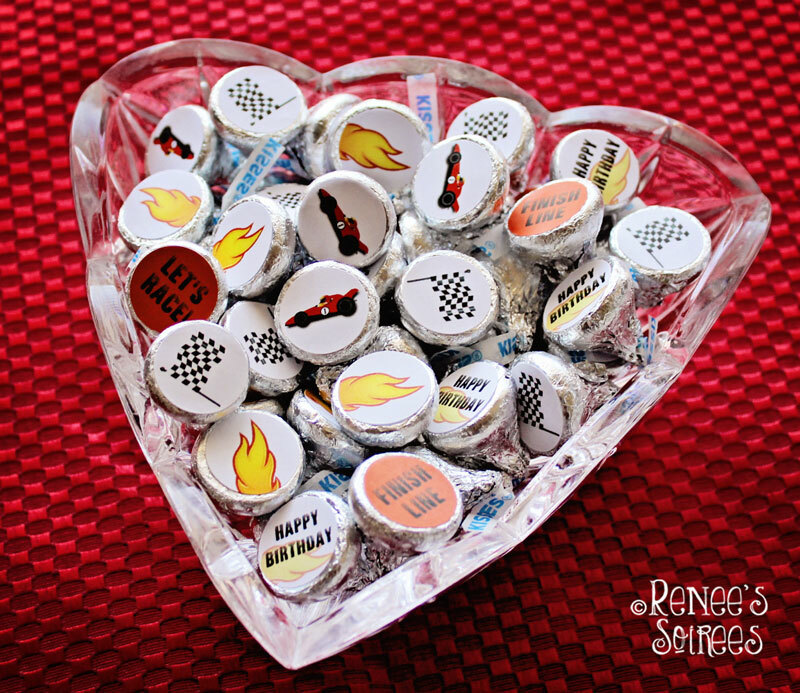 The 4″ medallions, pre-filled with words like “TOOLS” and “ANTI-FREEZE” are included with the Race Car collection. 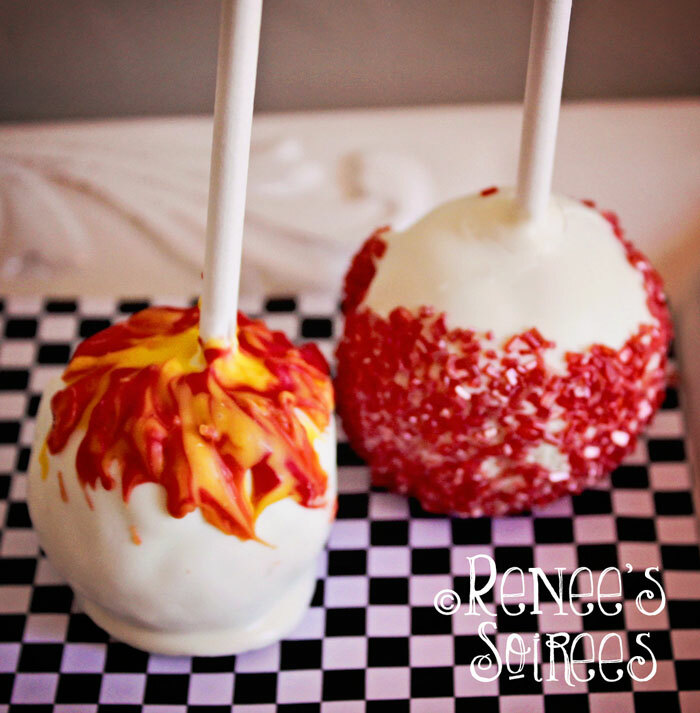 I asked a cake pop maker to make me some FLAME cake pops. I loved how they came out! 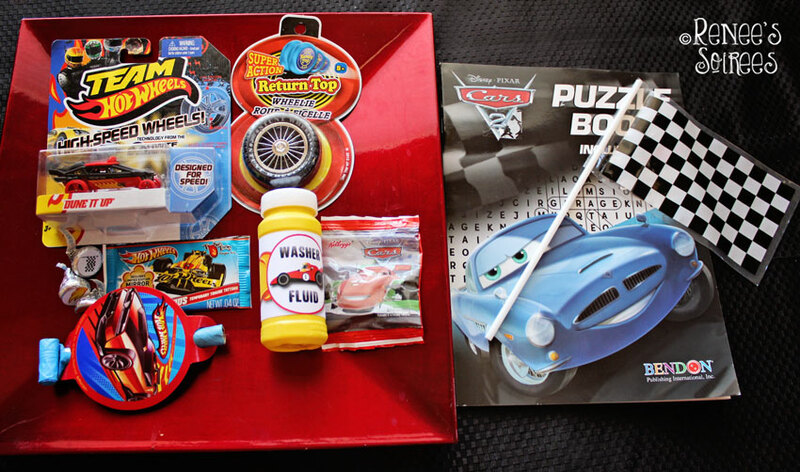 The part that gave me the biggest giggle… we used this red car out of Colin’s toybox. One of his classmates told him that she might bring her hamster FooFoo to the party. In his 8-year-old mind, he saw the hamster driving this car around. He made a note to put near the car that made it clear that this was ‘Fufu’s Car’… LOL!!! 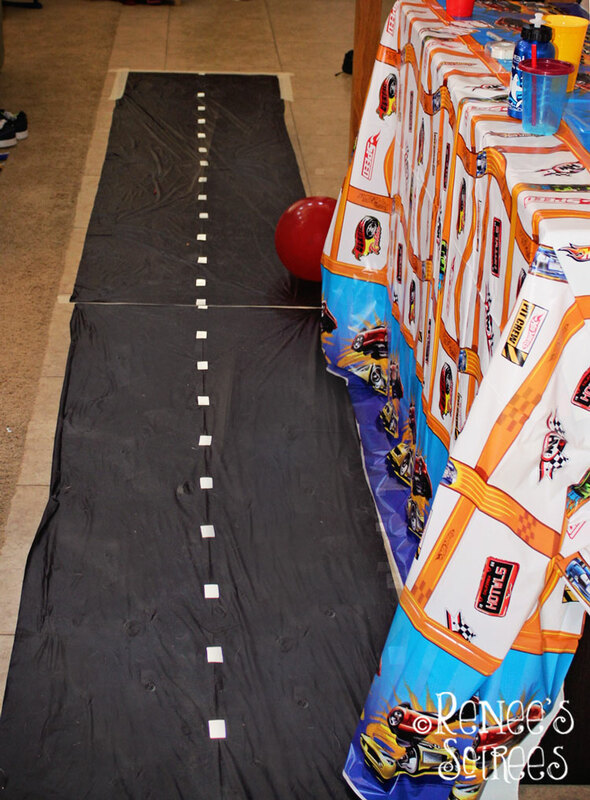 The activities part of the Race Car Party was super easy: a bunch of Hot Wheels out of my son’s room, and a few Hot Wheels tracks (one was Colin’s birthday present from Mom & Dad, the others we borrowed). 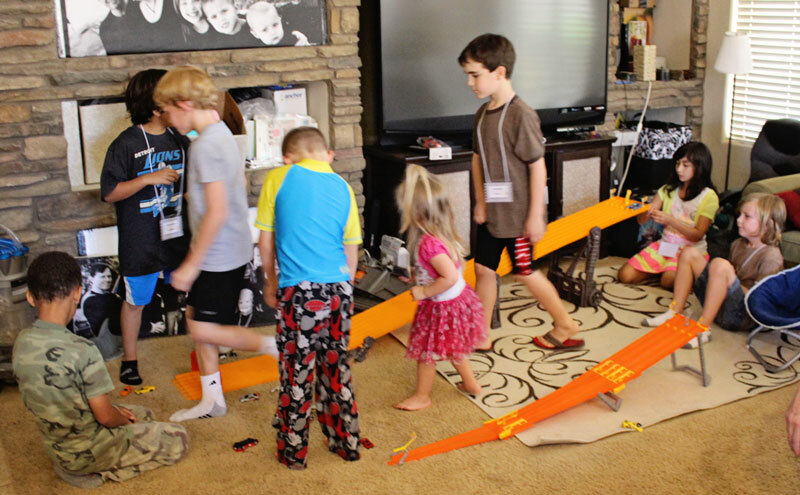 I was surprised that the girls at the party loved playing with the cars and tracks just as much as the boys did! And here is the favor bag! 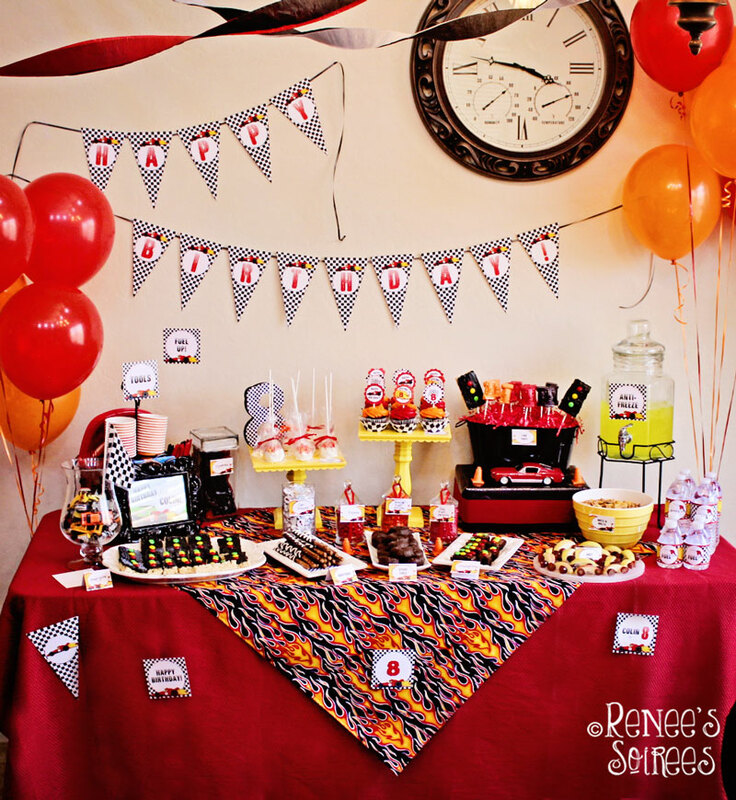 Decorated with the Goody Bag Tags (included in my printable collection). 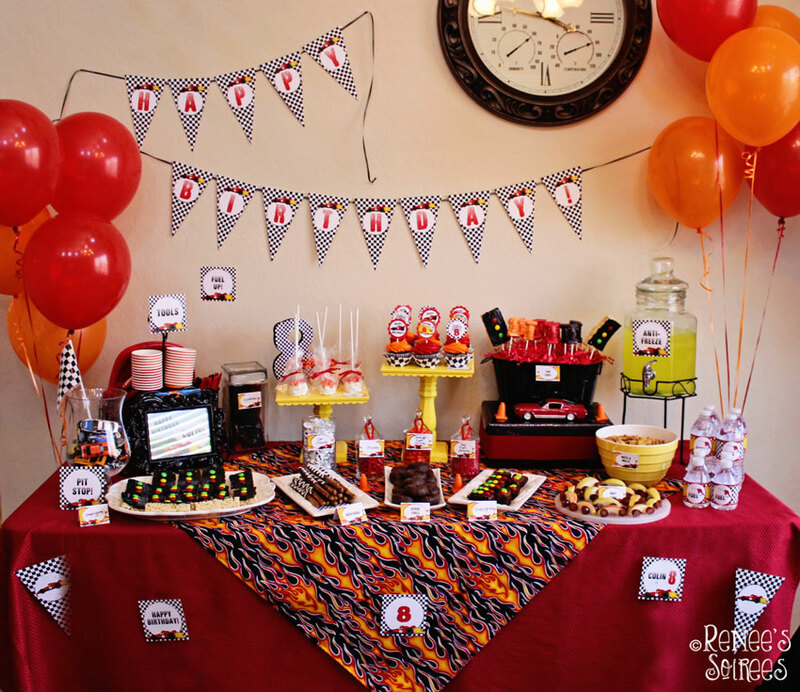 Favor items: a Hot Wheel, Wheel Yo-Yo, bubble bottle with racing bubble wrapper, Hot Wheels Tongue Tattoos, Disney Cars puzzle book, checkered flag, decorated Hershey’s Kisses with Race Car stickers from my shop, Disney’s Cars fruit snacks, and a race car party blower. It looked like a huge bounty to the kids, but actually each goody bag only cost me around $5. 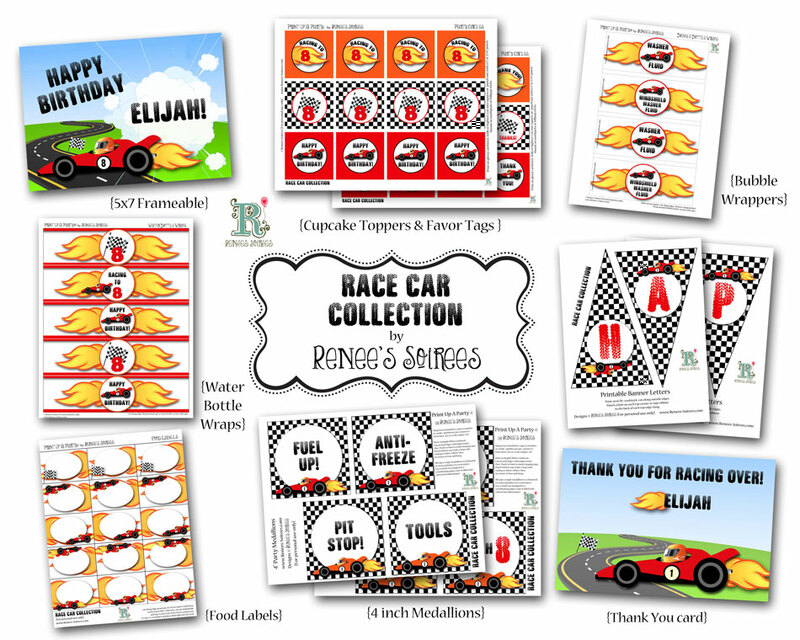 And you could easily pare it down to the $1/each range by just attaching a favor tag to a Hot Wheel car. We found this shirt in Colin’s closet, and thought it worked perfectly. 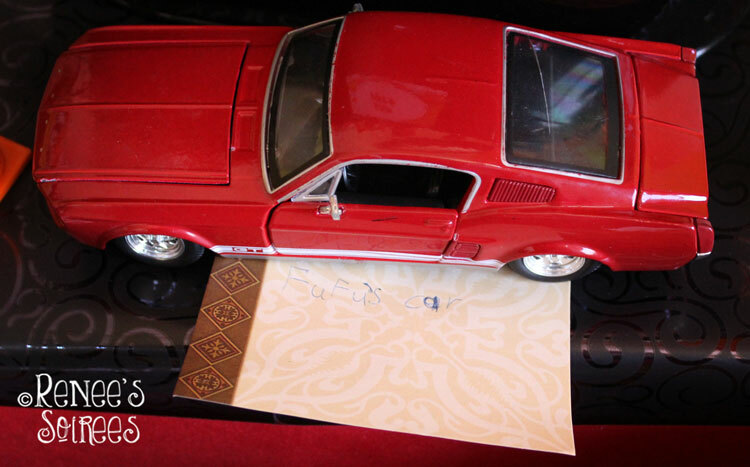 And like the Hot Wheel toys, it was a thrift shop find! 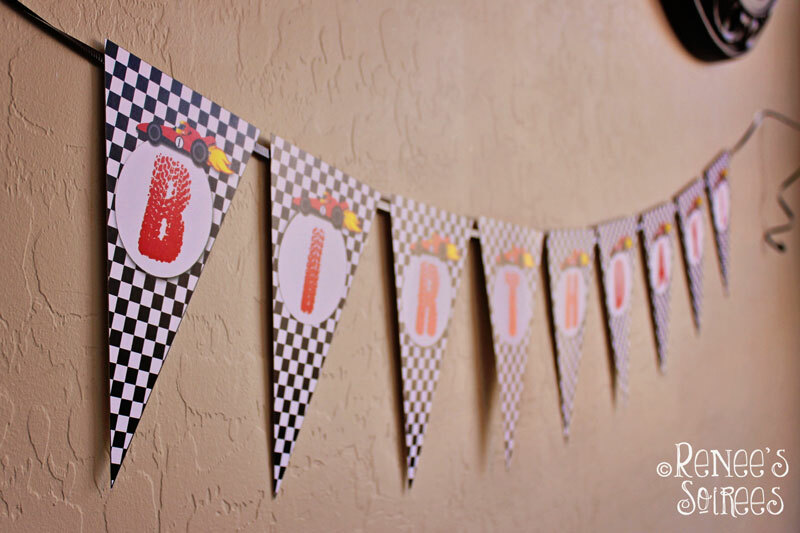 I hope you enjoyed my RACE CAR PARTY!! I know the birthday boy did! And so did his little brother! 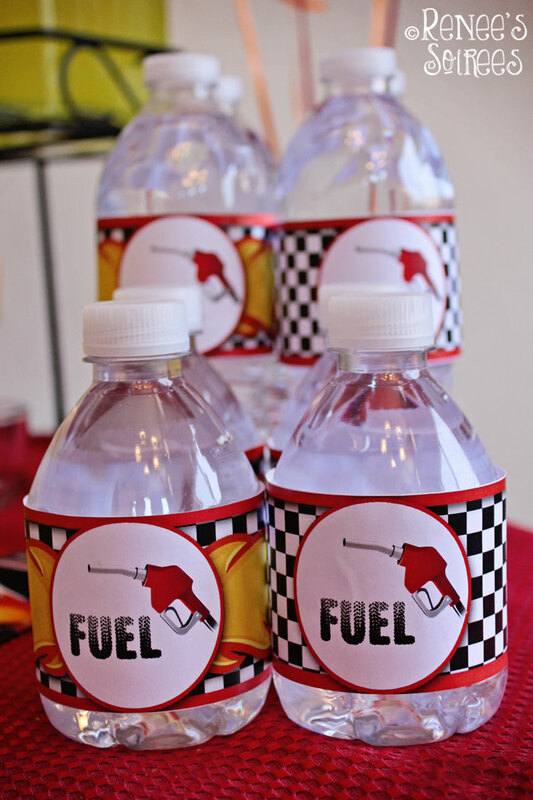 Favor Tags on Favor Bags ~ Available individually here (select Race Car from drop-down menu), or as part of the full collection. 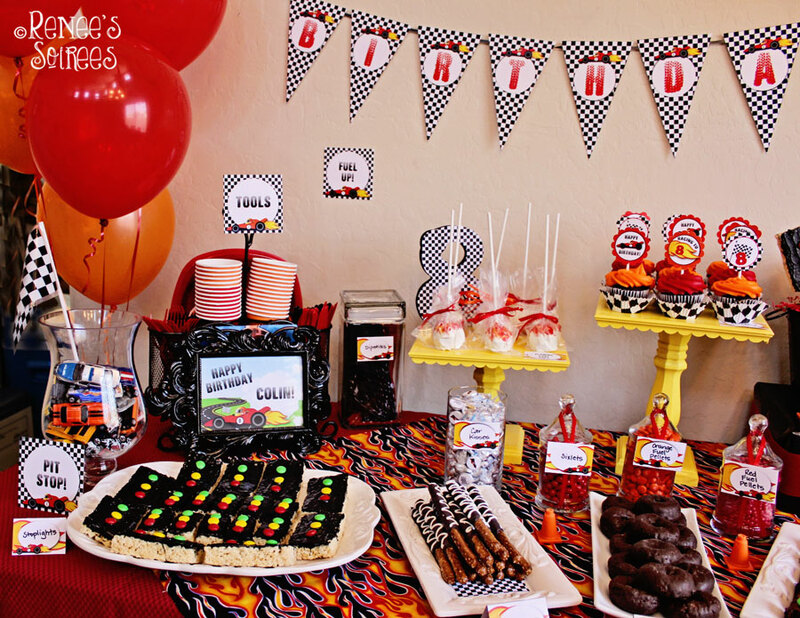 I’m doing a round-up of car party ideas at Disney Baby and wondered if I could include you. 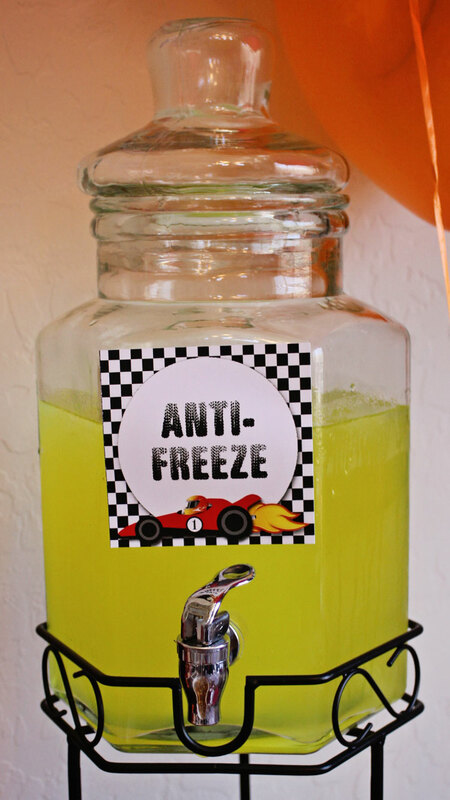 I’d use one photo of the anti-freeze drink with credit and a link back to this post Would that be okay? How did you make your anitfreeze punch? 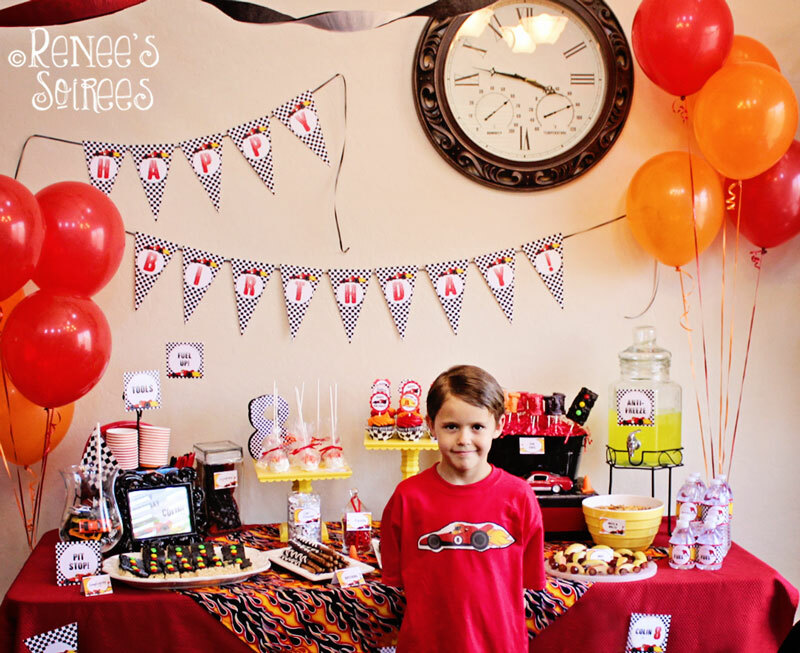 I love the orange icing – true orange – how did you make that? Actually I bought those cupcakes from Sam’s Club! 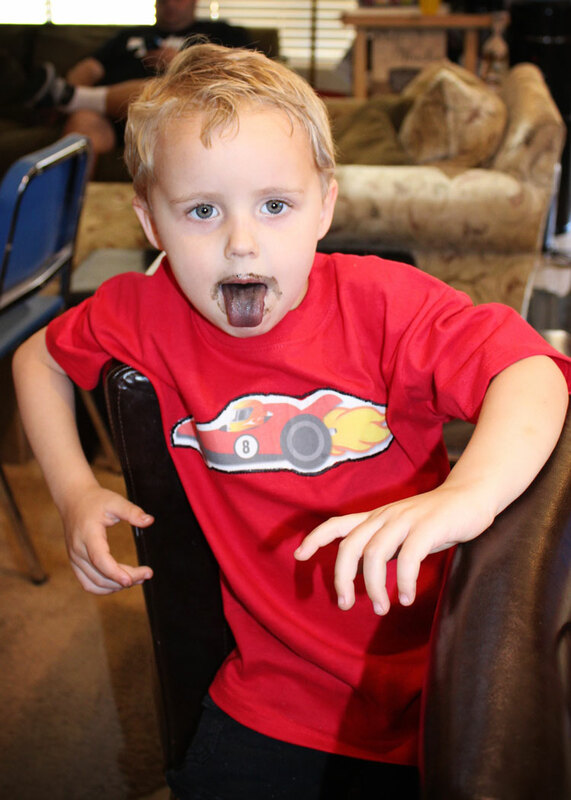 But if you want to make them yourself, in my experience, the gel food colorings work the best. (Available at craft stores). 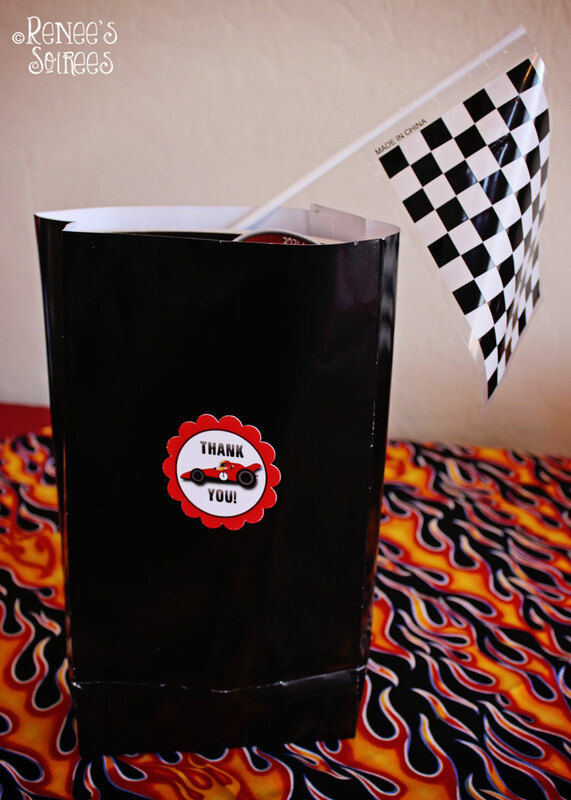 Where did you get the “Thank You” stickers for the favor bags? Select ‘Race Car’ from the first drop-down menu, and ‘Favor Tag’ from the second. Then I cut them out with this puncher. You can also order them pre-printed and pre-cut for $3 per dozen, plus shipping. I cannot find the printable link.. can you help? You mean where you can find the printable collection? 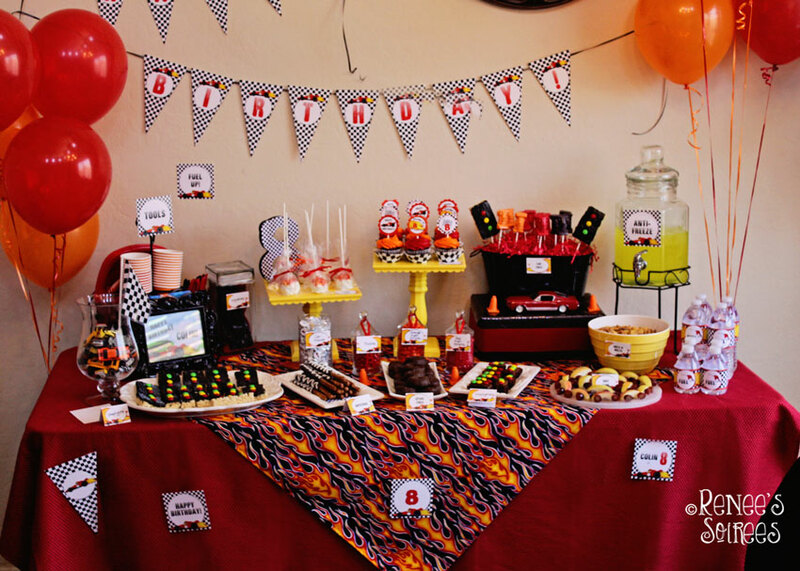 I love your ideas and am doing a similar party for my 3 year old twins. Do you have any other suggestions for me? I’m trying to keep it small but I love all your ideas! Thanks! The post shows all the ideas that I myself used, but you could always look for further inspiration on my Pinterest board, as there are a lot of ideas out there that I didn’t have the time or space to incorporate. 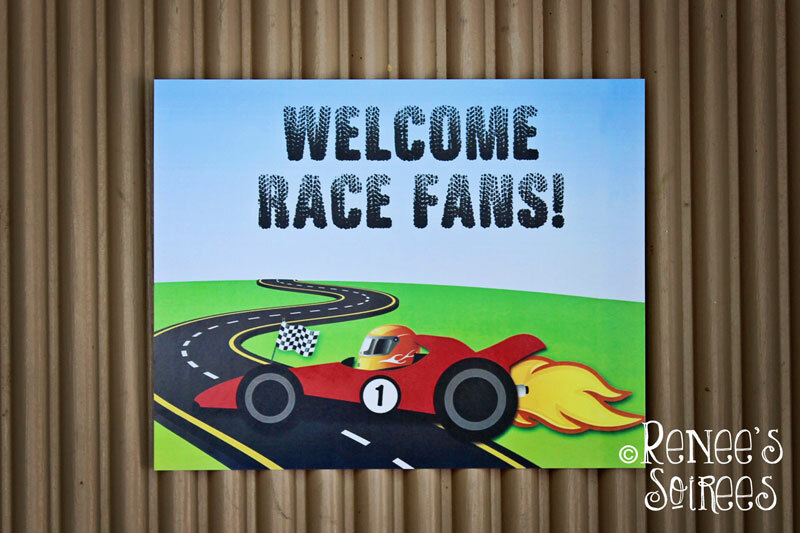 for the race car theme. Hi! 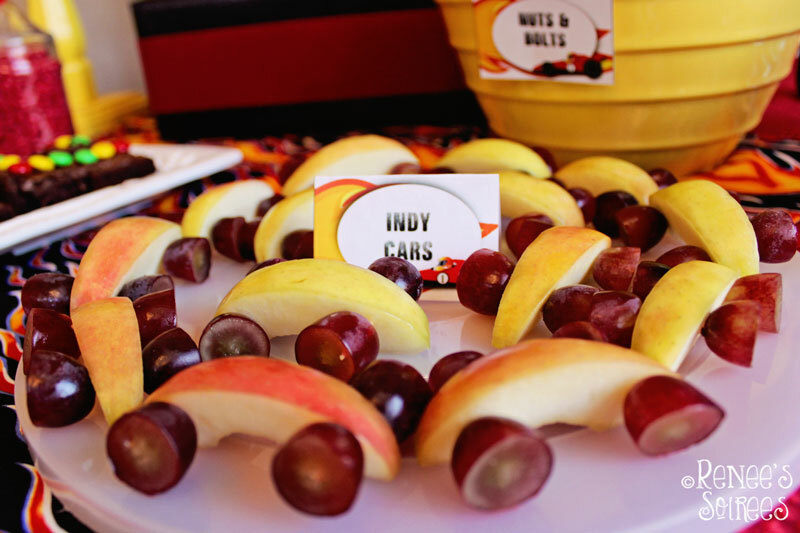 This is years later so not much if you would be able looking at this anymore but how did you get the grapes stick to the apples in the Indy cars? Thanks so much! It was super easy… We stuck a toothpick through the apple slice, and put a grape sliced in half on each side, with the cut (flat) side of the grape facing out. Depending on how thick your apple slices are, you may only need a half of a toothpick. (I’m pretty sure that’s what we did.) And sometimes we trimmed off any excess toothpick sticking out from the grape once they were assembled.